When thinking of beer in Prague, Pilsner Urquell automatically springs to most people’s minds. While Plzeň’s ubiquitous export is certainly a national treasure for the country ranked #1 in terms of beer per-capita consumption, local specialty microbrews are produced all over the Czech Republic. The capital in particular is the perfect place to hunt down interesting suds that confidently cater to the expanding market for niche beers, and some microbreweries in the city centre have being pouring for centuries. Sipping on the finest unique pivo the city has to offer is certainly a refreshing pastime, whether you’re an avid beer lover looking for a new thrill or an adventurer seeking a true taste of Prague. Here are five microbreweries to try out, all within easy stumbling distance of Prague’s main attractions. It’s worth making reservations before you go, though, as these pubs are just as popular with the locals as with visitors. At the Strahov Monastery, a beautiful Baroque complex close to Prague Castle worth visiting in itself, hoppiness is close to godliness. Brewing here dates back to the turn of the 14th century, and the result is three solid unfiltered varieties of its St. Norbert beer available year-round. The St. Norbert IPA (64 Kč per 0.4 L) is a top-fermented British-influenced Indian Pale Ale, brewed with Czech ingredients and two types of American hops (Amarillo and Cascade). The result is pleasantly bitter, light and hoppy. The amber (59 Kč) is a bottom-fermented all-malt ale inspired by Viennese lagers and the Bavarian Märzan. Extra-cold and refreshing. The dark lager (59 Kč) is brewed based on a recipe from Munich dating to the first half of the 19th century, and has a rich, chocolatey taste with a clear finish. Ignoring the kitschy faux-hops dangling from the ceilings and tacky murals isn’t hard at the New Town Brewery thanks to the venue’s attention-grabbing svelté, or light, lager. The cloudy, unfiltered beer at this central brewhouse, founded in 1993, has hints of lemon and a yeasty drinkability, with no added preservatives, and at 38 Kč per half-litre has a price that goes down just as easily. There is also a dark version on offer, as well as novelty flavoured beers, including banana, which are only available in a four-set tasting menu (for 200 Kč). For those up for the task of tackling — or sharing — a substantial meal, try the famous pork knuckle here, served on a massive board with shredded horseradish and mustard, perfect for soaking up the liquid appetizers. Vat’s enough beer for you Pavel! The “Brewers’ House” opened in 1998, and has probably not seen an empty table since. Locals and tourists cram onto the wooden tables here to sample the excellent beer as well as the reasonably priced fare. Pivovarsky Dum is known especially for its experimentations with beer, such as adding cherry, chilli, coffee or nettle flavourings (not all together, of course), as well as beer champagne and beer aperitifs. The pale lager though shines just as much, as do the dark, wheat and mixed (half-and-half pale and dark) varieties. Nearly all beers are 40 Kč per glass, although some come in larger glasses than others. Most are also available for super-sizing, to the towering 4-litre “Giraffe” which is brought tableside and from which guests draw their own pints. The beers are also eight for the price of seven when ordered this way. 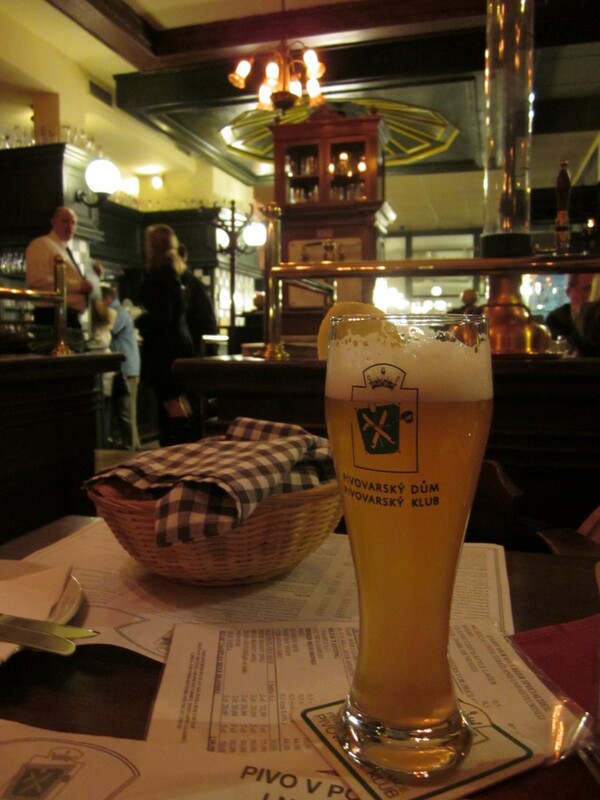 If you can beat the tourist mobs to a seat at one of U Fleku’s long, beer-hall tables, hold on to it. The boisterous and smoky atmosphere (or, in warmer months, the expansive beer garden out back) is completed by folk-costumed accordion players and lightning servers who pass around 0.4 litre mugs of the microbrewery’s namesake dark lager (59 Kč), a delicious, chocolately brew with strong cameral notes. Waiters also push trays of Becherovka, a herbal liquor from Karlovy Vary, under patrons’ noses, professing as “anti-freeze” what is actually a pleasant, warming shot strongly evocative of Christmas. 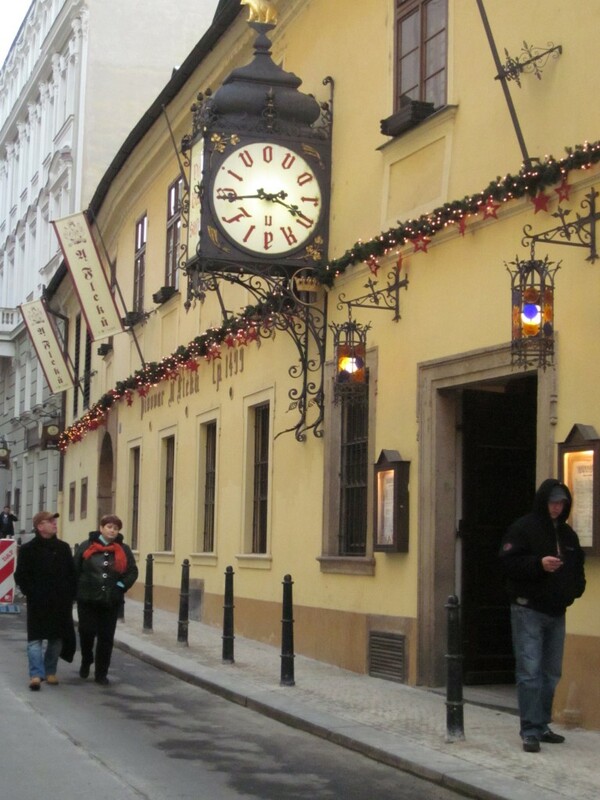 U Fleku dates back to the 15th century and is the only brewery in Central Europe to brew beers for 500 years straight. The iconic clock, whose numbers are replaced by the name “Pivovar U Fleků” beckons people in off the street. Located centrally between Wenceslas Square and the National Theater, “At the Bears” boasts one of the strongest beers in the world, its specialty, X33, which has a 12.6% alcohol content and the highest wort density on earth. Arched ceilings and long, wooden tables line the labyrinth of rooms of U Medvídků, which dates to 1466. The microbrewery’s main beer is Old Gott, an unfiltered, amber lager (50 Kč for 0.33 L), a smooth sipper, as well as several other varieties. U Medvídků is also known for its impressive menu of Czech food, where one can sample the traditional svičkova or goulash, or be bold and try the “brewer’s tasting menu” that includes cheese and icecream made from the good stuff itself. 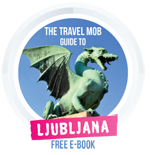 If you like the sound of these venues, then you might want to consider signing up for this highly-acclaimed tour offered by GetYourGuide. It calls by three of our top five above – Pivovarsky Dum, U Fleku and U Medvidku – and introduces you to 11 varieties of Czech beer in the company of a tasting expert. Or else check out this tour by Urban Adventures, which takes you to four beer halls in the less touristic Zizkov and Vinohrady districts, and also introduces you to some signature Czech snacks such as finely smoked pork neck with homemade potato pancakes – a Bohemian specialty. 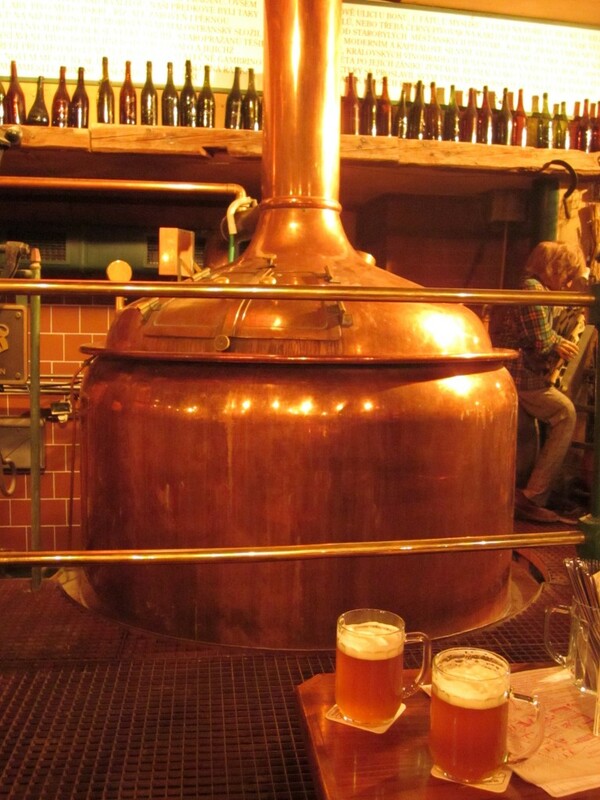 For something even more hands on what about this tour of the Czech Beer Museum, which finishes with tasting four of the country’s finest brews. Best of all you get to operate the on sight brewery’s machinery and bottle your own beer! And if you want to go even deeper into the region’s brewing history, how about a tour of a millennium old monastery to taste the liquid gold produced by Bohemia’s Black Monks? Whatever you plan on doing in the Czech capital don’t forget to pass by our ultimate city break guide for bags more great tips! I would like to present a mini – brewery with classic czech cuisine and home beer. It has a lot of good feedback and review around the world and we wish to be in your list too. If you could help me with that we will be really appreciate. 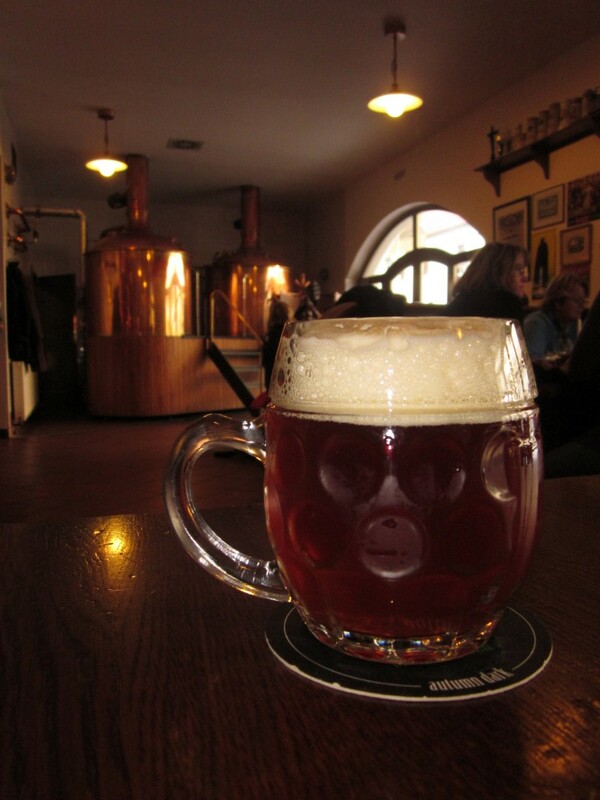 Love this post about Czech breweries. I am originally from the Czech Republic and haven’t been to any of those. I will have to visit at least one next time I am in Prague. Thanks for sharing this. Thanks for these great tips Marek… that’s certainly a tantalising list you’ve added! Will have to drop by Prague again soon! Fiona Gaze is a British-American writer and editor based in Roztoky, a small town just outside Prague, where she has long written for The Prague Post as restaurant critic, food blogger and chief copy editor.